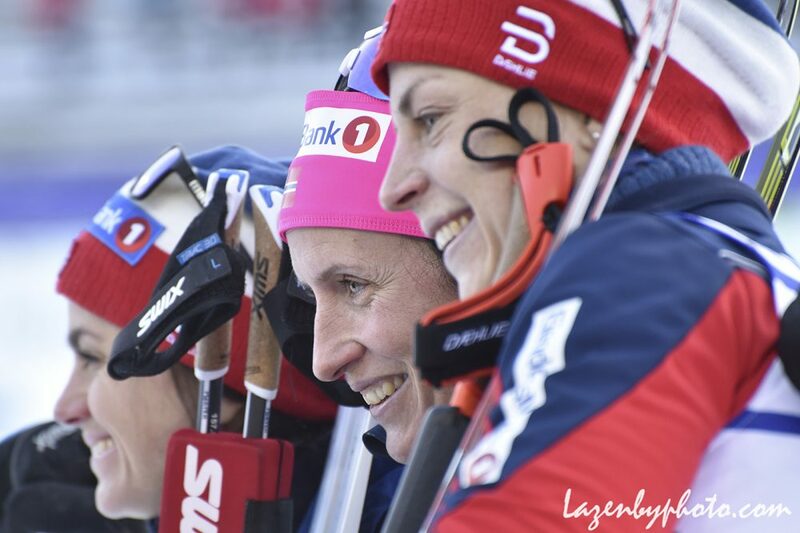 LAHTI, Finland — 1, 2, 3, 4: Norway’s Marit Bjørgen, Norway’s Heidi Weng, Norway’s Astrid Uhrenholdt Jacobsen, Norway’s Ragnhild Haga. That’s how the women’s 30-kilometer freestyle mass start at the 2017 Nordic World Championships ended on Saturday. Bjørgen has two previous 30-kilometer championship titles, but Saturday’s was her first in freestyle. She won the race in 1:08:36.8 hours, just 1.9 seconds ahead of a hard-charging, photo-finishing Weng for second and Jacobsen for third. Haga finished fourth, 5.5 seconds off the podium and 7.4 seconds after Bjørgen. Weng explained that though she was aware Bjørgen’s move might come on the climbs and Jacobsen’s more likely on the downhills, her strategy was to stick with the two as long as she could. “I don’t like 30 k’s,” the silver medalist admitted. While Jacobsen has podiumed in a World Cup 30 k once before — two years ago in Oslo, Norway — Saturday’s 30 k top-three finish was her first at world champs. Almost immediately out of the start, Jacobsen was on the ground and ceded approximately twenty seconds to the sharp end of the pack. After hitting the ground hard, she righted herself and hammered; by two kilometers she was 10.8 seconds off of the front and catching their draft by five kilometers. It was Jacobsen’s third medal at these championships — she took bronze in the 10 k classic and gold in the 4 x 5 k team relay. For certain, Bjørgen was the racer to mark. Along with the relay, she had already taken gold in both distance races (the 15 k skiathlon and 10 k classic) over the last week. 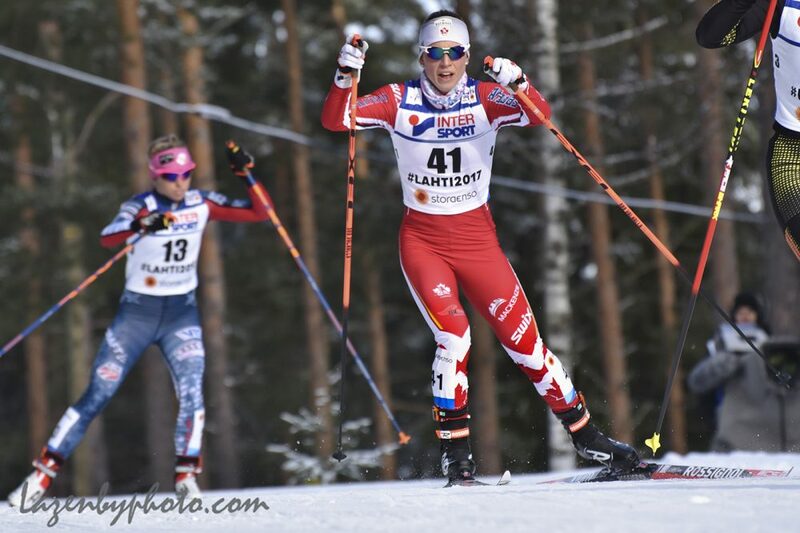 But, due to what was described as icy and fast snow and many racers coming into the 30 k with self-proclaimed, top-end fitness, Bjørgen was unable to stamp her trademark move in this race. In other words, a group of nine skiers remained cohesive until the final headwall of a climb. On this day, like the boss she is, she kept her cool. All this despite breaking a pole and her inability to shake the pack. Bjørgen may have difficulty returning to Norway for next week’s World Cup races in Drammen and Oslo as she’ll need to pass through Helsinki, Finland’s airport security with four golds in her carry on. The buzz in the media center after the race spoke less about Norway’s dominances and more about some stand-up North American performances. A Swedish colleague listening to the race on a live radio broadcast from Sweden, said many asked about one name in particular: Chelsea Holmes. Holmes, an American skiing out of Alaska Pacific University (APU), finished 7.2 seconds outside of the top 10 in 13th (+1:28.1). Saturday’s competition was Holmes’s first World Championships race experience. The 30-year-old Alaska native made her European World Cup debut last season after having raced in the Canadian World Cup races in 2012 in Quebec City, Quebec. Holmes hadn’t done any World Cup races this year until two weekends ago in Otepää, Estonia. 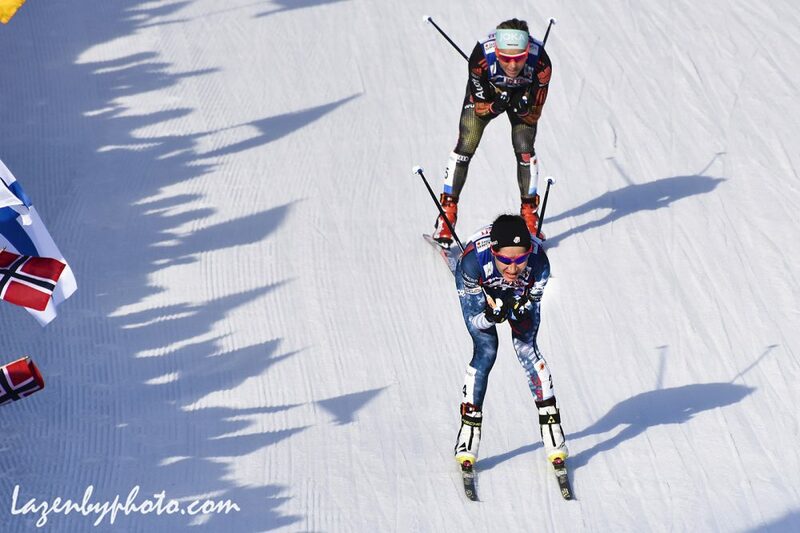 Saturday was Holmes’s second time scoring points; her previous World Cup best was 22nd at last year’s Ski Tour Canada. With a deep field of women to choose from, Holmes’s opportunity was almost bypassed. As U.S. Ski Team Head Coach Chris Grover explained, Holmes was the third American alternate for Saturday’s 30 k.
“We approached Sadie [Bjornsen], who of course has been on a World Cup podium in skate this year in 5 k, quite a different event, but we approached her, she really did not want to race today,” Grover said, adding that she wanted to prepare for the upcoming World Cup classic races in Norway. For Holmes, the race couldn’t have played out better. She skied in a pack with Russia’s Yulia Tchekaleva, Switzerland’s Natalie von Siebenthal and Germany’s Stefanie Böhler. Sometimes at the head of the group, sometimes in the draft, Holmes never relinquished contact with a potential 10th place until the final kilometer. “I was mostly surprised that they were still there,” Holmes said of her ability to stick within the chase pack of four. Finishing ahead of Holmes as the first American across the line was Jessie Diggins in fifth (+10.4). At this point, Diggins’s result, beyond the fact that it comes in a mega-distance, surprised no one. 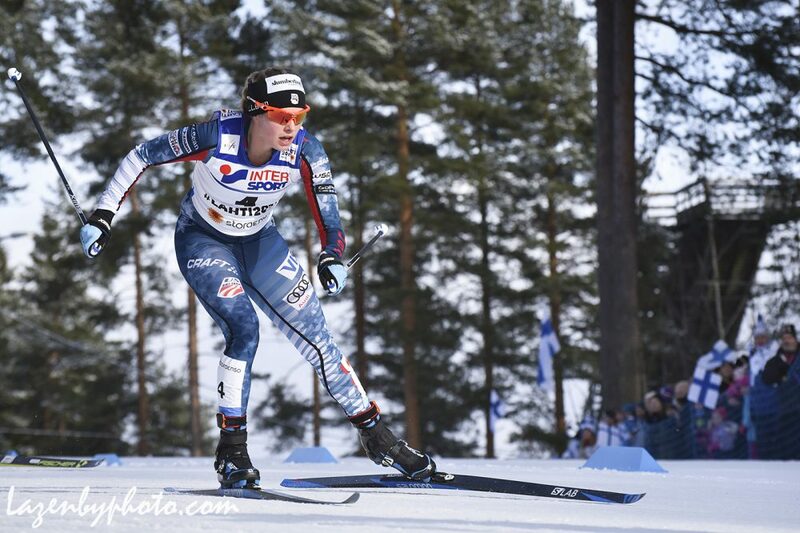 Diggins’s fifth place was the best American result in a World Championship 30 k. She was in the hunt for a podium with nine other skiers deep into the race. 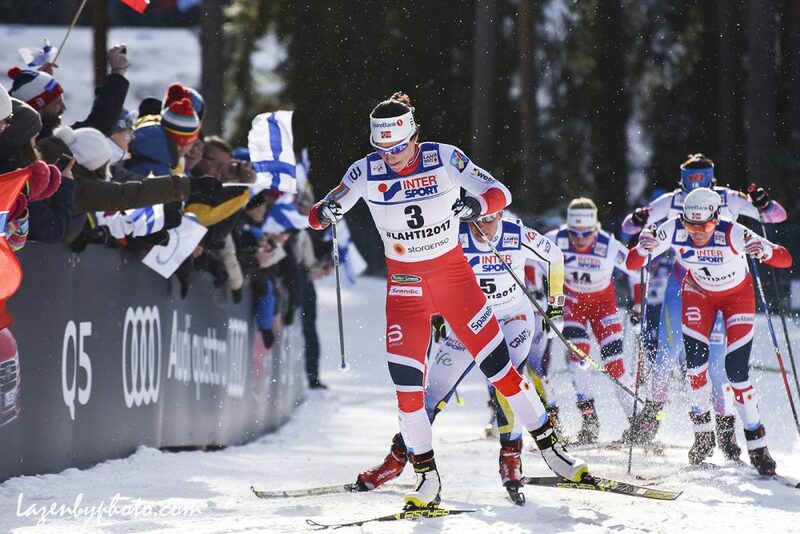 When Bjørgen made her late in the game kill-shot, the nine skiers were moving up the final climb. This is where Sweden’s Charlotte Kalla, another winning threat on Saturday, stepped on her own pole putting her out of podium contention. With that, four Norwegians broke away and Diggins followed. Diggins leaves these championships confident about her current and future place in the sport. Asked about the diversity of her strong performances in both the short and long distances, the 25-year-old Minnesotan responded that being a well-rounded skier has been the primary objective. She continued that some of her better results are yet to come. The next two Americans across the line were Liz Stephen in 25th (+3:09.4) and Caitlin Gregg in 36th (+5:03.7). Stephen’s best 30 k result on the World Cup are two ninth places, one in 2013 and one in 2015, both at Holmenkollen in Oslo. 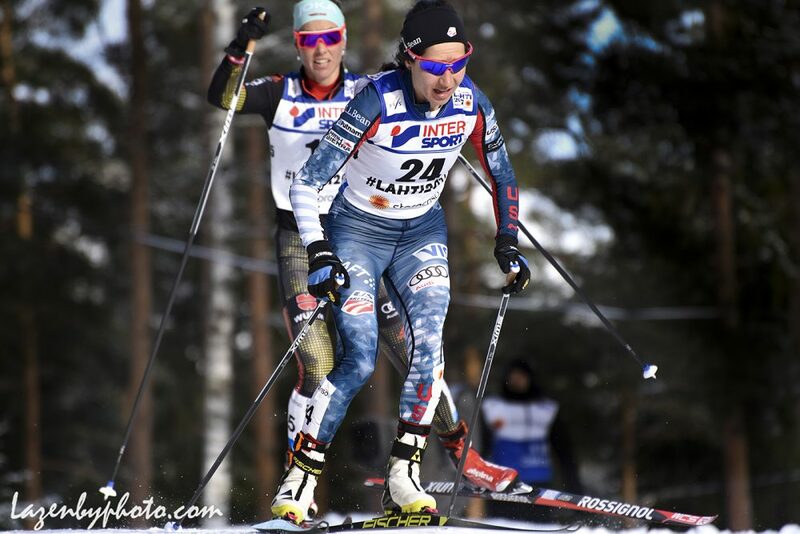 At the 2015 World Championships in Falun, Sweden, Stephen finished 11th in the 30 k classic mass start. Gregg medaled earlier in those championships, finishing third in the 10 k freestyle in Falun (behind Diggins in second). The last race Gregg contested was the Boulder Mountain Tour on Feb. 4, which she won. Canada’s Cendrine Browne led her team in 26th (+3:16.0) for her best individual result to date and first time scoring World Cup points (top 30). 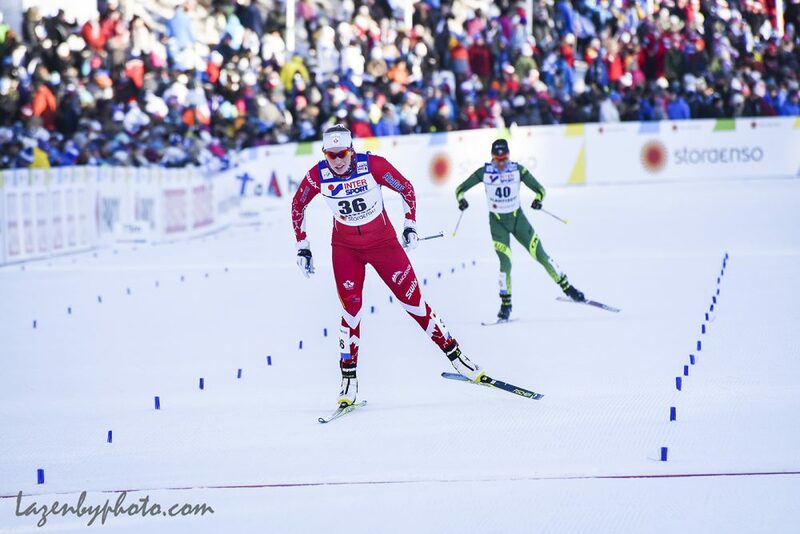 Browne skied within 17 seconds of the race leader at 11 k, when the pace started to pick up. After that Brown lost contact with the front group. The second Canadian to finish was Dahria Beatty in 34th (+4:45.2). Saturday marked Beatty’s second 30 k, and her first at the World Cup level (she raced the Canadian National Championships 30 k freestyle mass start in 2015, where she placed third). Canada’s Emily Nishikawa finished 40th (+6:41.5) followed by Katherine Stewart-Jones in 41st (+7:18.6). The final event of Lahti World Championships, the men’s 50 k freestyle mass start, takes place on Sunday. 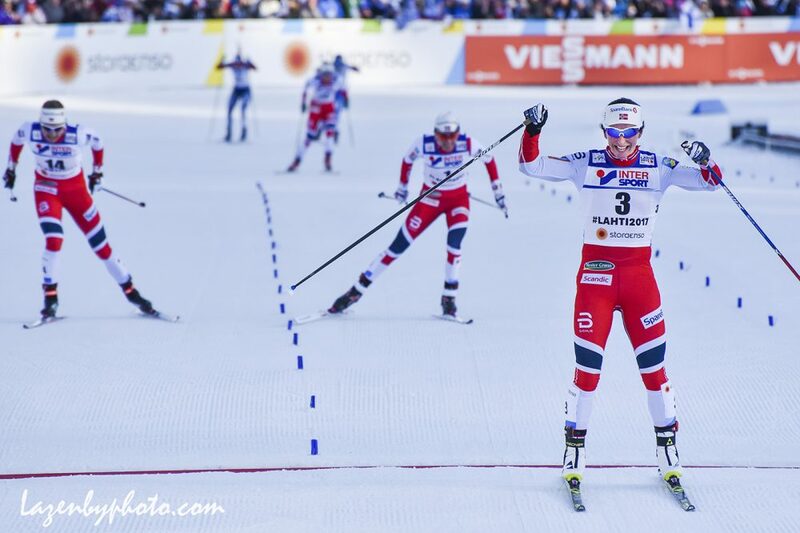 The post Clean Podium Sweep for Norway in Lahti 30 k: Diggins Conquers 5th appeared first on FasterSkier.com.